Wenceslas Square, really more of a boulevard than a square, is one of the main squares in Prague and a center of business, culture, and entertainment for the entire city. The square is named after Saint Wenceslas, patron saint of Bohemia, and was originally designed in 1348 by Czech King and Holy Roman Emperor Charles IV as a horse market. 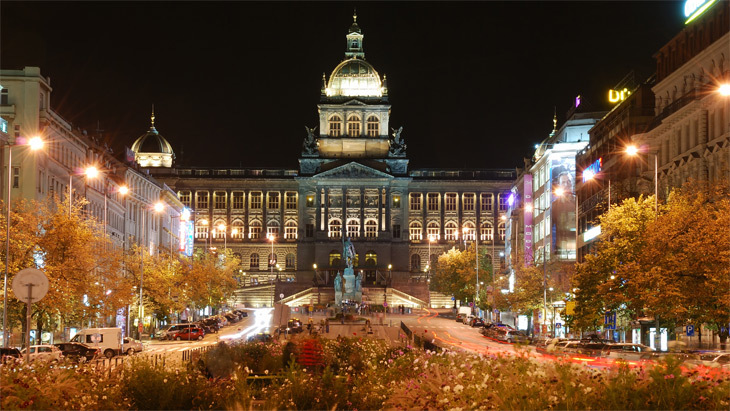 Wenceslas Square is lined with hundreds of different shops, clubs, offices, and restaurants, and features the magnificent neoclassical Czech National Museum at one end. In front of the museum is easily the most famous and recognizable meeting point for Praguers from across the city – the Wenceslas Monument with Saint Wenceslas riding atop a horse looking down across the square. The square also factors prominently into Czech national history, as many people will recognize it as the sight of mass demonstrations during the Velvet Revolution in 1989. Any trip to Prague will, and should, include a visit to Wenceslas Square. It is centrally located with all three metro lines and many different tram lines intersecting.